Cool as a cucumber. He’s not fazed in a conflict setting and in conference he’s very knowledgeable and easy to speak to. 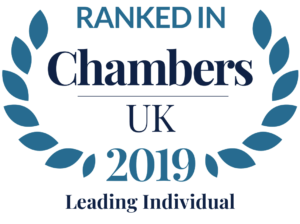 Cameron is recognised as a leading consumer law and trading standards barrister by both of the independent legal directories, and undertakes the full spectrum of consumer and trading standards law, encompassing fraud and money laundering. His experience includes representing private companies, local authorities and private individuals in both criminal prosecutions and Part 8 Enterprise Act 2002 enforcement (including secondary contempt proceedings), as well as advising on compliance with consumer and trading standards legislation for the purposes of civil and/or criminal liability, and for the purposes of professional discipline. He has particular experience in relation to the letting and estate agency industries, pricing, advertising, food, powers of enforcers, the Consumer Protection from Unfair Trading Regulations 2008 and the Business Protection from Misleading Marketing Regulations 2008, where he is one of few practitioners to have obtained an injunction under Regulation 15. His work has included advising National Trading Standards and various of the national trading standards teams on the correct interpretation of consumer law and strategic implementation of that law. The London Borough of Barking & Dagenham v X  – Successful defence of a national retailer in relation to age restricted sale allegations. The case was disposed of without further court proceedings. Wandsworth Borough Council v South Western Magistrates’ Court  EWHC 1079 (Admin) – High court case to determine the meaning of “advertising” for the purposes of the Town and Country Planning (Control of Advertisements) Regulations 1992. Cameron’s consumer and trading standards law experience has naturally led him into the sphere of brand protection, where he is again recognised by the independent legal directories for his contemporary legal advice. He is an expert on the Trade Marks Act 1994 and has advised and represented both local authorities and brands in both public and private prosecutions, as well as advised and appeared in civil IP infringement cases. He has additional expertise in copyright infringement cases, where he is sought after counsel in relation to criminal cases involving Internet Protocol Television (IPTV). Cameron has been instructed to prosecute in several high profile heath and safety cases, including in relation to fire safety and where, tragically, deaths have resulted. He is an expert on the Fire Safety Order (2005) and has particular experience in the care home sector. He is currently instructed by the prosecution in a case involving the death of a teenager at a care home. Peterborough City Council v A Ltd  – Advising the prosecution in relation to alleged health and safety breaches by a company responsible for running multiple children’s homes. The case involved a fatality. Cameron has significant experience advising and representing parties in proceedings relating to product safety and liability. This experience includes prosecuting breaches of safety legislation, advising on safety notices and appearing in appeals and arbitration arising from the same. In addition, Cameron has advised on group litigation proceedings arising under Part 1 of the Consumer Protection Act 1987. Middlesbrough Council v Thompson  – Representing the prosecution in what has been described by the BBC as “the test case” to establish the legality or otherwise of certain IPTV devices that allow the streaming of live premier league football matches. Cameron’s general regulatory law practice encompasses professional discipline, inquests, planning enforcement, financial market abuse (he was the author of the chapter on the cartel offence in Modern Financial Regulation) and licensing, in which he is regularly instructed in relation to issues relating to Alcohol, SEVs gambling and Taxis. I am a barrister that provides legal services. You can contact me at cameron.crowe@goughsq.co.uk , on 0207 353 0924 or at Gough Square Chambers, 6-7 Gough Square, London EC4A 3DE.